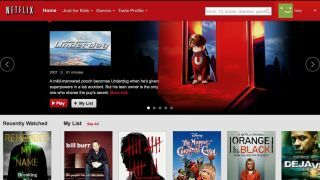 Netflix may be preparing to introduce a new way to pay for its service, with a select number of US users currently being offered a number of new subscription options. The plans start with $6.99-a-month that will allow subscribers to watch one video stream at a time in standard definition (slightly cheaper than the current $7.99 (£5.99) plan that allows for two streams on one account), followed by $9.99-a-month plan for three streams in standard or high definition. "There's no new plan - this is a test, they said. "We always are testing new things and this is a test for a $6,99 single stream plan and $9.99 for a three streams plan. Not all people will see this option and it may not be something we ever offer generally." Netflix also told us that the test is only taking place in the US for now, so Brits won't be offered the chance to try out the new subscription models for now.